Madam Bozena poses with Prince Krzysztof Konstanty Radziwill of Poland at JW Marriott Gangnam hotel in Seoul on April 28, 2016. Madam Bozena Giacchini, the former chairwoman of Polish-Korean Chamber of Commerce in South Korea, arrived in Seoul from United Kingdom on April 28, 2016. This time Madam Bozena brought with her a Polish noble man "Prince Krzysztof Konstanty Radziwill," a direct descendent of Grand Duchy of Lithuania. Madam Bozena, once resident in Seoul for many years, has been visiting Seoul from Europe where she is involved in art and other businesses. At a brief meeting held at JW Marriott Gangnam Hotel in the afternoon of the arrival from London, she gave a detailed explanation about her and the Polish prince's visit to Seoul. "I arrived in Seoul with the price because of art-related business and three other business projects between Poland and South Korea," Madam Bozena said. "That is why Prince Radziwill came to South Korea with me"
Thanks to her explanation and through her interpretation Prince Radziwill was able to reveal his business projects. "I wanted to cooperate with South Korean art galleries and art experts," Prince Radziwill said. "I have my own art gallery in Mongolia and I wish to exchange works of arts with art galleries in Seoul." Madam Bozena said that Prince Radziwill owns an art gallery of his own "Duke and Dutches" in the Mongolian capital of Ulan Bator. On April 29 (Friday) Madam Bozena and Prince Radziwill visited Gnasong Art Museum in Seongbuk-dong in northern part of Seoul and met with its art director. Madam Bozena said that they agreed on a wide range of cooperation for exchange or works of art, and exchange of European and Korean artists. "New ecological energy for the industrial waste is also on the list of my business projects," said Prince Radziwill. "For this we met with South Korean environment officials." Madam Bozena poses with a local art critiques in Seoul. The Polish prince also said that he is very much interested in the development of new technology to lessen carbon dioxide emissions. He went on to say that the European companies developed new technology in this field, claiming that he and his companies hold some patents for this project. "We are seeking partner companies in South Korea," Prince Radziwill said. "They can cooperate with us or make an investment for our project." "Finally, we came here to seek South Korean partners in tourism business," he added. "We have hotels-related businesse"
He explained that Poland has a number of clear and beautiful lakes, and its Baltic sea coasts are rapidly developed for hotel and other toursim-related business. Madam Bozena at International Arts Exhibition she organized at Sejong University in Seoul on Nov. 8-14, 2014. In particular, Prince Radziwill said that he is also seeking South Korean partners for his movie project "Soul of the Murdered Kingdom," he tentatively dubbed. He said that he wants to shoot the film on the semi-tropical area of Jeju Island off on the tip of the Korean Peninsula. "The budget of the entire movie project is expected to cost between 3 and 4 million Euros," he explained. "But, the cost would be far less if it could be made by Polish-South Korean product." He added that Brad Pitt and other Hollywood stars and experts were contacted by him. The scenario of the planned epic film "Soul of the Murdered Kingdom" is based on the "Saint-Domingue expedition," in which Napoleon Bonaparte sent his army to regain French control of the Caribbean colony of Saint-Domingue (modern Haiti), according to the Polish prince. Both Madam Bozena and Prince Radziwill will go back to London on May 1, (Sunday), 2016 to prepare for their upcoming business projects in Mongolia. 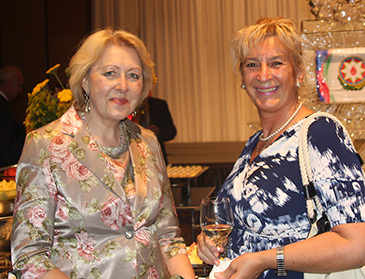 The Seoul Times file photo shows that Mrs. Bozena Giacchini right), chairwoman of Korean-Polish Chamber of Commerce & Industry poses with Mrs. Yulia Vnukova (left), spouse of ex-Russian Ambassador to Seoul Konstantin Vnukov at Russian Embassy in Seoul. Madam Bozena Giacchini, the former chairwoman of the Korean-Polish Chamber of Commerce in South Korea, has long been a promoter of art exhibitions and art exchanges between Europe and Korea, and globally. Two year back Madam Bozena brought four Western artists to the local Korean art exhibition. They were Joseph Kucinski of America, Suzanne Woitowich of Canada, Anna Olga Aristowa of Russia, and Sebastian Cichon of Poland. The 16 selected works of art of the international artists were on public display from Nov. 8 (Saturday) through Nov. 14 (Friday), 2014 at Sejong University in Seoul. Additional 16 works from a local South Korean artist Ms. Jeong Hae-Jin are also exhibited. It was the first visit and first art exhibition in Seoul Korea for the four Western artists, thanks to Madam Bozena. 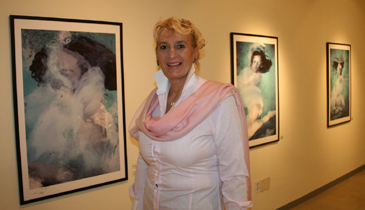 "I want to promote international arts exchanges through this exhibition,” Madam Bozena said. "I hope to introduce more international artists to the South Korea." Who Is Prince Krzysztof Konstanty Radziwill? 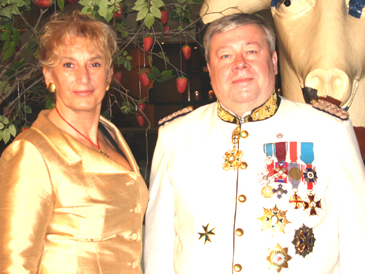 Prince Krzysztof Konstanty Radziwill was born on 18 of December 1958 in the city of Gdansk. He is the bailiff of Poland of the Order of Saint Lazarus and the direct descendant of Prince Mikołaj Krzysztof Radziwill (1515 – 1565) nicknamed “The Black,” one of the most prominent members of the Radziwill Family. Radziwill Family is a Polish noble and aristocratic family originating from the Grand Duchy of Lithuania. The descendants of Kristinas Astikas, a Lithuanian and a close associate of the 14th century Lithuanian ruler Vytautas, were highly prominent for centuries, first in the Grand Duchy of Lithuania, later in the Polish–Lithuanian Commonwealth and the Kingdom of Prussia. The family has produced many individuals notable in Lithuanian, Belarusian, Polish, German (particularly Prussian) and general European history and culture. The Radziwill Family received the title of Reichsfürst (prince) from the Holy Roman Empire.